Our Employment and Training Program gives you the practical skills you need to contribute as a training coordinator in a first nation organization, company or government agency. The role of the employment and training coordinator has grown steadily in importance. Hands-on learning techniques are used to teach the skills required in actual job situations. The activities you undertake in this program will help prepare you for a career in today’s human resources field. This Employment and Training Management diploma program will enhance your marketability and give you the relevant professional skills and knowledge that employers in today’s marketplace are looking for. The program gives you the opportunity to acquire a comprehensive background in the functions of Human Resources from both theoretical and practical perspectives, including employment law, recruitment and selection, training and development, reward systems and compensation. The focus of the program is on applied, relevant and current learning. Plan, organize, direct, control and evaluate the operations of employment & training and, or personnel departments. Plan human resource requirements in conjunction with other departmental managers. Co-ordinate internal and external training and recruitment activities. Develop and implement labour relations policies and procedures and negotiate collective agreements. Administer employee development, skills development and academic training, language training and health and safety programs, secure funding for community members. Advise and assist other departmental managers on interpretation and administration of personnel policies and programs. Oversee the classification and rating of occupations. Organize and conduct employee information meetings on employment policy, benefits and compensation and participate actively on various joint committees. The Employment & Training Coordinator is responsible for establishing effective working relationships with community groups, funding agencies and other external contacts. The Employment & Training Coordinator will assist members of the Band pursue training and employment opportunities as per their respective agreements. Textbooks currently in use in this program. 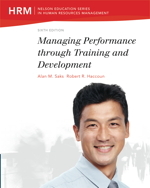 Managing Performance through Training and Development, 6th Edition. This course enables students to identify their personal learning style and learn about key study skills such as: mind mapping, time management, keeping a study diary, reading and writing techniques, as well as listening, speaking and telephone techniques. In this course stuents will learn the skills needed to take full advantage of Microsoft Office applications and features. Students will learn how to manage data in spreadsheets, compose error-free documents, organize email, build engaging presentations, and much more with Microsoft Office. The primary aim of this course is to enable students with an understanding of the impact that their communication skills can have on others, while exploring the different ways in which developing these skills can make it easier for them to succeed in the work force. Audiences do not come in one size, mentality, temperament. In order to be effective and most importantly, adaptive, public speakers need to react appropriately in situations where the audience is hostile, demanding, or difficult. This course is tailored to those seeking the confidence to speak up in meetings, make presentations on behalf of their organization, or effectively organize thoughts and ideas to convey them convincingly, persuasively, and confidently. In this course students will enhance their communication, understanding, and ability to educate employees and supervisors to support the wealth of talent, ideas, and skill within their workplaces. Students will learn: what diversity and its related terms mean, to be aware of their own behaviors and how they can improve, to identify their stereotypes, the four cornerstones of diversity, the STOP technique and how to take action if discrimination takes place. In this course students will learn how to recognize how their own attitudes and actions impact others, effective techniques for dealing with difficult people, strategies for dealing with anger, and how to cope with the difficult people and situations that we will inevitably encounter in our everyday lives. Students will gain an understanding of performance management, training, development, and human resource development. This course will describe the performance management process and the role of training and development. Students will learn benefits of training and development for organizations, employees, and society and discuss training and development in Canada. This course will enable students to understand and explain the role of the environmental and organizational context of training and development and the human resources system. Students will also discuss the instructional systems design model of training and development. This course will define organizational learning and describe a learning organization. Students will review five disciplines of a learning organization and discuss the principles of a learning organization and the four key dimensions that are critical for creating and sustaining a learning organization. This course will define knowledge management and explain how knowledge is acquired, interpreted, disseminated, and retained in organizations. Students will discuss workplace learning, informal learning, and formal learning, and describe what organizations can do to facilitate informal learning. This course will also describe the multilevel systems model of organizational learning. This course provides students with an understanding of learning and describe learning outcomes. Students will discuss three stages of learning, resource allocation theory and review learning styles and the learning cycle. This course describes conditioning theory and social cognitive theory and their implications for training and development. Students will discuss adult learning theory and its implications for training and development. This course defines motivation and describes need and process theories of motivation and their implications for training and development. This course will enable students to conduct a needs analysis and describe the needs analysis process. This course will describe and explain how to conduct an organizational, task, and person analysis. Students discuss the process of determining solutions to performance problems and review different methods and sources for conducting a needs analysis. This course will also describe the obstacles to conducting a needs analysis and how to overcome them. This course will introduce students to training objectives and describe the four elements and three components of them. Students will discuss the factors to consider when deciding to purchase or design a training program. This course will review the purpose of a request for proposal and how to create an effective one. Students will learn how to determine the content of a training program and discuss types of training methods. This course defines the following instructional methods: lecture, discussion, case study, case incident, behavioural modelling, role play, games, simulations, and action learning. Students will discuss the advantages and disadvantages of each instructional method. Students will also discuss the factors to consider when choosing an instructional method. This course defines the following on-the-job training methods: job instruction training, performance aids, job rotation, apprenticeships, coaching, and mentoring. Students will discuss the advantages and disadvantages of each training method and learn how and when to effectively use each training method. Students will be introduced to the coaching process and how to design a coaching program. This course defines mentoring and describes how to develop a formal mentoring program. Students will also discuss the advantages and disadvantages of on and off-the-job training methods. In this course students are introduced to technology-based training, traditional training, computer-based training, and e-learning. Students will compare and contrast instructor-led and self-directed learning and discuss asynchronous and synchronous training. Students will discuss electronic performance support systems, video conferencing, web conferencing, webinars, webcasts, and the virtual classroom. Students will review mobile learning and discuss its use for training and discuss how to design computer-based training programs. This course defines a lesson plan and describes how to develop one and the information that should be included in a detailed lesson plan. Students will review the characteristics of an effective trainer. Students will also discuss some of the problems and solutions of training delivery. Students will be introduced to the major barriers to the transfer of training and discuss the strategies that managers, trainers, and trainees can use before, during, and after training to improve the transfer of training. This course describes what a post-training supplement is and describe booster sessions, self-coaching, and upward feedback interventions. Students will be introduced to the transfer system and describe the transfer system factors. This course describes training evaluation and the main reasons for conducting evaluations. Students will discuss the barriers to evaluation and the factors that affect whether or not an evaluation is conducted. Students will be introduced to different types of evaluations and examine models of training evaluation and the relationships among them. This course examines the main variables to measure in a training evaluation and how they are measured. Students will also discuss the different types of designs for training evaluation as well as their requirements, limits, and when they should be used. This course discusses why trainers should calculate the costs and benefits of training programs and describes how to calculate the cost of training programs Students will discuss the difference between cost-effectiveness and cost–benefit evaluation. This course will enable students to conduct a net benefit analysis, benefit–cost ratio, and return on investment of training programs. This course introduces students to orientation training and essential skills training. Students will discuss technical skills training and information technology training along with WHMIS legislation and health and safety training programs. Students will examine team training and the skills required of team members and discuss sales training and the skills required to be effective in sales. Students will also examine ethics training, diversity training, and cross-cultural training. This course examines management and management development and explains how it is different from employee training. In this course students will discuss the main roles, functions, and critical skills of managers and be introduced to emotional intelligence and its relevance for management. This course examines the models of management skill development and describes the use of error-management training for management development. This course will describe the content of management skills development programs and discuss the different types of management development programs. Students will also examine job rotation and coaching and discuss the characteristics of great coaches, the five conditions that are necessary to ensure the development of managers, and the challenges of coaching. In this course students will be introduced to the changing role of training professionals and discuss the outsourcing of training and development. This course will explain the role of ethics in training and development and define Learning 2.0 and describe the evolution of training and development in organizations. This course will also define lifelong learning and describe the four pillars of lifelong learning.